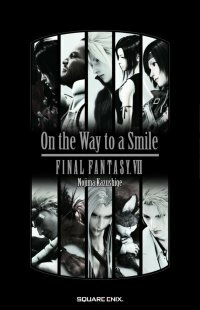 On the Way to a Smile is a novella written by Kazushige Nojima, set in Gaia during the time of and right after Meteorfall. Originally it had only two parts, but a third part - Barret's story - was added in the US release in 2007, and the remaining ones with the publication of the book. The book itself was first published in 2009, and it bears the ISBN of 978-4-7575-2462-0.